An entrepreneur at heart, Mr. Mgaya was always looking for ways to increase his income. He had an interest in planting fruit trees, but lacking information and resources he was forced to stick to outdated, inefficient farming methods and familiar crops. He never dreamed he would be able to grow fruit trees that would not only produce enough crops for sale but significantly increase his annual income and standard of living. The USAID-funded Tree Crop Program implemented by EnterpriseWorks/VITA (EWV) in collaboration with Associates in Rural Development (ARD) opened new horizons for Mr. Mgaya and other farmers like him by providing comprehensive training in the areas of nursery establishment, propagation, grafting, pruning, outplanting, nursery management and marketing. A motivated participant during training, Mr. Mgaya decided to devote his time to establishing and managing a fruit orchard and a successful commercial nursery. Mr. Mgaya is a quick study and his hard work paid off. 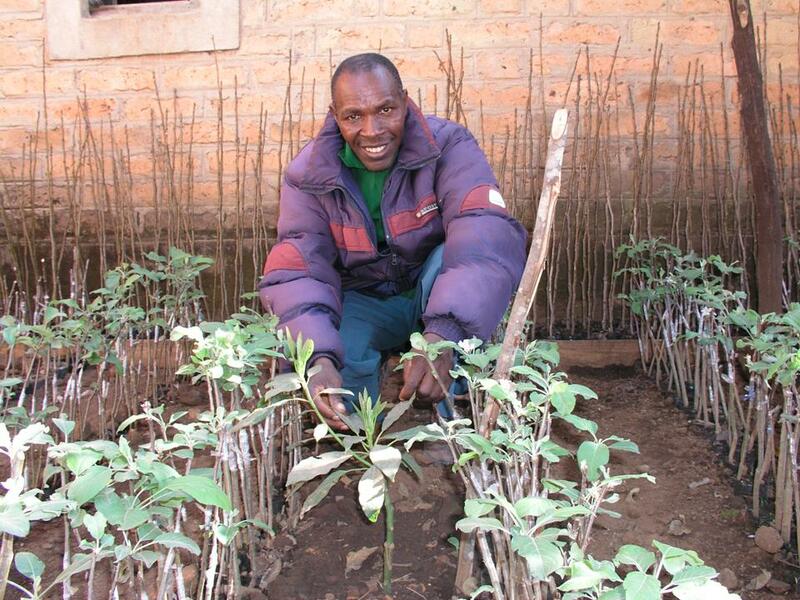 In this year alone, he planted 1200 improved apple and avocado fruit tree seedlings with a value of $2000 and he has increased his effectiveness and efficiency in avocado and apple grafting to an almost 100 percent success rate. Producing quality fruit is only part of the business equation. EWV also worked with Mr. Mgaya and other farmers to educate them on the importance of proper marketing. These lessons focused on access to market information, including desired quality and packaging requirements, and learning how to make informed decisions about where and to whom to sell their produce. Now Mr. Mgaya is generating a profit of at least $500 every planting season. The profit generated is from nursery produce and fruits marketing through producer groups. These additional earnings have made a world of difference to his quality of life. Among other things, Mr. Mgaya has been able to pay school fees for his children and finalize the building of his house. Additionally, he is investing a percentage of his profits back into his business by expanding his fruit orchard and buying new fruit cultivars for his nursery. He even plans to buy a used motorcycle so that he can deliver produce to devoted customers that are far away. In June 2007, Mr. Mgaya was invited to attend the Annual Dar es Salaam International Trade Fair (DITF), an annual forum that has established itself over years as the shop window for Tanzania products. He assisted in showcasing the EWV Tree Crops Project, illustrated grafting and budding techniques to the viewing public, and represented his farmer group from Njombe District of Iringa Region, all while making new business contacts in Dar es Salaam and beyond. Recognizing the value of all that he has learned, Mr. Mgaya is now actively providing support, advice and training to other farmers and nearby villages. He believes this will help the community around to produce a large quantity of fruit and meet market demand. EWV Tanzania’s Country Director, Michael Fredericksen, is planning to assist Mr. Mgaya in becoming a local Business Development Services provider so that in the future he can offer his services for a nominal fee.